There are stories we grow up hearing; we can never unknow them. Spread through culture by constant retelling, we engage with fairytales like Little Red Riding Hood and Cinderella every day. They inform our conception of reality. A strong vein running through the collection is a tribute to Aboriginal stories. While it’s clear that Dreamtime is not yet integrated into Australian imagination, several contributors share the ways indigenous storytelling has changed their lives. Leonie Norrington’s ‘Old Women’s Business’ describes her second mother, a Mayali women she calls ‘Albadjan’. 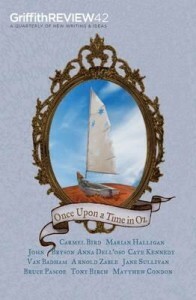 Albadjan used storytelling to teach Norrington as she grew. When Norrington revisits the community as an adult, an auntie tells a story about ‘Gurrdji’. The tale depicts a young woman corrupted by white way of life, contrasting the two cultures. She goes on to explain the essential nature of Dreamtime by quoting Bob Randall, a Yankunytjatjara man. Dreamtime, or Tjukurrpa, is reality; not a thing of the past but something that exists way back when, as well as now and forever. As well as being instructive and spiritual, stories shape our identity. In ‘A touch of silk,’ Victor Marsh considers the process of identifying as a gay man, and the various narratives our culture provides for someone coming out. Early explorations of official texts defined his desire as an ‘abnormal perversion’, and cultural authorities like science and religion determined him an outcast. Marsh investigated how overarching myths construct our identity, and the freedom of alternatives. Other texts in this collection further explored the ways stories shape our understanding, expectations and behaviour. In ‘The myths of Azaria, so many,’ John Bryson weaves a tight web examining the way the media’s framing of the death of baby Azaria Chamberlain influenced public conception (and in this case, the outcome). Ecstatic at the hint of the epic tale of an evil mother, the media disseminated ideas of a ritualistic killing that expanded with every whisper. Bryson’s fantastic essay details the way the media forced a story into the shape of a primal myth, and the perversion of justice that followed. Michelle Law brings attention to one of the primary myths that is played out in our culture: the Happily Ever After. She debunks the blanket relevancy of fairytale romance and the marriage/mortgage/kids script by exploring her family’s relationships. Mirroring this sentiment, Danielle Wood attacks the exhausting expectation of ‘The good mother’—the model parent seen on billboards and TV ads. The good mother ladles out guilt from her seat of perfection, but does she truly exist? There aren’t many bad things to say about this excellent collection of writing—Griffith Review is known, after all, for printing some of the best essays Australia has to offer. However, some of the heavier nonfiction articles tend to overstate the theme, and despite the honouring of Indigenous perspective, there weren’t many Aboriginal voices telling ancient Tjukurrpa stories. Despite these qualms, Once Upon a Time in Oz flowed beautifully. What’s more, nestled amongst top notch storytelling and analysis are political ideas crucial to Australian society. The writers’ abilities to use traditional fairytales as a prism to examine our culture anew proves the everlasting necessity for stories. This entry was posted in Books and tagged aboriginal, australia, fairy tales, folk, storytelling, tradition. Bookmark the permalink.